About 150 people gathered in front of San Francisco City Hall on the 44th anniversary of Martin Luther King Jr.'s assassination as part of the "Occupy the Dream" rally. The crowd chanted, "Let freedom ring!" and one woman held a painted portrait of Martin Luther King Jr. during the rally in San Francisco Wednesday. The anniversary of Martin Luther King Jr.'s assassination, recent shootings of young black males, the Occupy Wall Street movement and the upcoming Easter and Passover holidays converged at a rally held Wednesday in front of San Francisco's City Hall. About 150 people gathered on the Polk Street steps around 11:30 a.m. on the 44th anniversary of Martin Luther King Jr.'s assassination as part of the "Occupy the Dream" rally. The rally, led by NAACP San Francisco branch president the Rev. 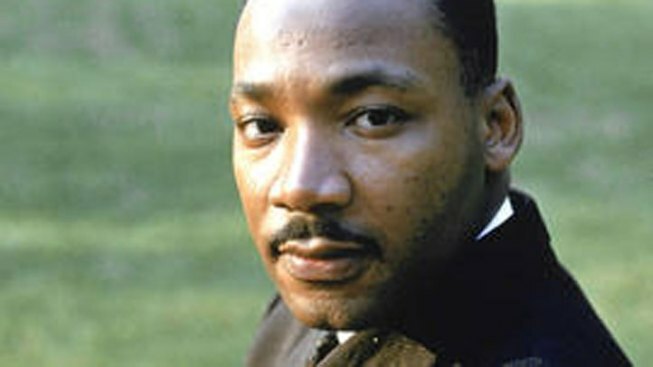 Dr. Amos Brown, religious members from the Occupy SF movement and other faith leaders reflected on King's assassination on April 4, 1968 along with the killings of Trayvon Martin, 17, in Sanford, Fla., in February and Lawrence Richardson, 21, in San Francisco's Western Addition Monday night. Archbishop Franzo King from the St. John Coltrane African Orthodox Church in the Western Addition bellowed into a megaphone, "We are here to relight and rekindle the fire (Martin Luther King Jr.) so bravely lit and carried...Today we have violence against our children, communities, homes and jobs." The crowd frequently chanted, "Let freedom ring!" and several people carried signs that said, "Justice for Trayvon Martin." At the top of the steps one woman held a painted portrait of Martin Luther King Jr., while another woman carried a photograph of Richardson, the 21-year-old San Francisco man killed Monday night. On March 30 Brown led a rally pushing for the arrest of Martin's killer, neighborhood watchman George Zimmerman. Martin was fatally shot Feb. 26 while unarmed and carried only a pack of Skittles and a bottle of iced tea at the time of the confrontation. Zimmerman, who has claimed he acted in self-defense, has not been arrested nor charged with a crime. Brown said today's rally was for the marginalized and disenfranchised. 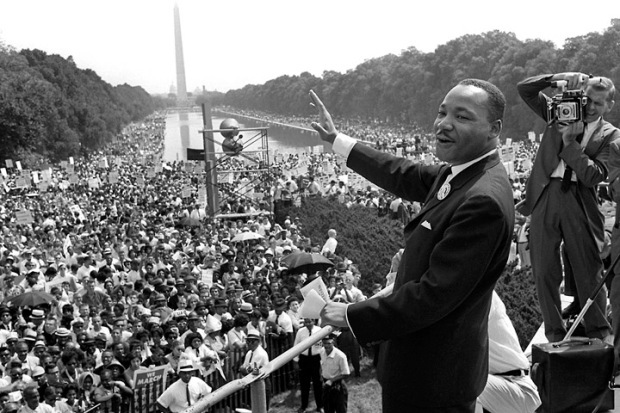 "We are here for the "unfinished dream," he said, a wordplay on King's famous "I Have a Dream Speech" from 1963 on the steps of the Lincoln Memorial in Washington, D.C.
Brown recalled meeting King at the Bill Graham Civic Auditorium in 1956, saying, "I never shall forget that night." The Rev. Vicki Gray, the deacon at Christ the Lord Episcopal Church in Pinole recognized this week as Holy Week, or the week leading up to Easter Sunday and the Jewish holiday, Passover, and that this is an appropriate moment to "stand up for civil and economic rights for people in this city losing jobs, homes and even children." Faith leaders concluded the rally with a call to march to the nearby Wells Fargo Bank at 1266 Market St. to ask for what Archbishop King called "a moratorium on foreclosures and evictions." As the group crossed Civic Center Plaza they shouted, "Banks got bailed out, we got sold out" interspersed with singing and chants of "We are the 99 percent."